NPS closed this cave picking a borderline excuse. The entire canyon is crawling with rodents, probably best to live inside a double plastic bag with an oxygen bottle. The NPS Office of Public Health has determined the cave was not a hantavirus source and reopened. Impressions of the dazzling topography of Grand Canyon have changed and shifted since that day in the summer of 1540 when Garcia Lopez de Cardenas gazed out from the South Rim. The conquistador saw a worthless desert wasteland, nothing more than a barrier to political expansion. At the opposite extreme, the modern view tends toward the romantic, reveling in what we today perceive as the remarkable spirituality of the gorge. Products of the age in which they lived, American pioneers arriving in the 1890s were more practical and utilitarian: they assumed with so much exposed bedrock inevitably there had to be mineral riches waiting to be claimed by those willing to go below and look. 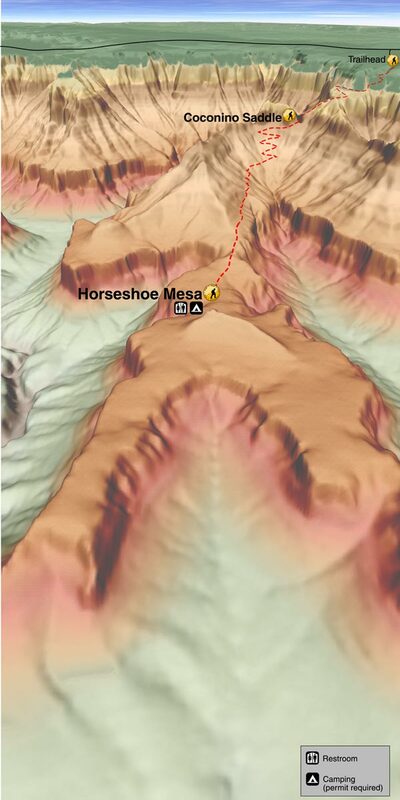 Would-be miners fanned out across the inner canyon, probing everywhere, and at a place called Horseshoe Mesa found what they sought. Rich copper deposits initially averaging 30% pure promised wealth, but only if transported from the depths. Optimism reigned supreme, a route was scratched out, and in February 1893 an endless succession of mule trains began moving raw ore to the rim along a rough canyon track originally known as the Berry Trail, more recently as the Grandview Trail. More than any other canyon trail, the Grandview is steeped in the legacy of the mining days at Grand Canyon. Numerous small artifacts associated with these halcyon days are scattered across the top of Horseshoe Mesa, providing a link across the years. Hikers can inspect the physical remains of this bygone era while enjoying canyon scenery at its finest. 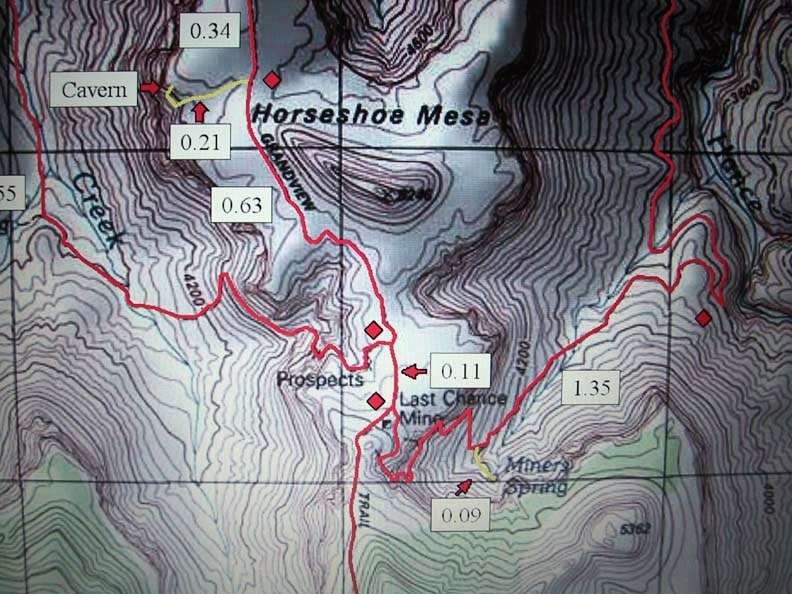 Description of route to the large cavern on the west face of Horseshoe Mesa. Access is via the Grandview Trail from the south rim of Grand Canyon National Park. The cavern itself is also described to the extent of my limited exploration. The cavern is huge and easily accessed. The adventure is superb. Drive to the south rim of the Grand Canyon National Park. From Grand Canyon Village, drive east along the rim road. Park at the Grandview Point parking area and trailhead. Hike 2.6 miles down the Grandview Trail (which is quite steep) to the intersection of the Grandview Trail with the trail that drops off the west side of Horseshoe Mesa to Cottonwood Creek. 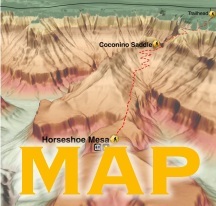 The trails are well marked on the USGS topo map and on any good trail map of the Canyon. You will know you are at the right spot when you see the (now roofless) stone cabin just beyond the trail intersection. 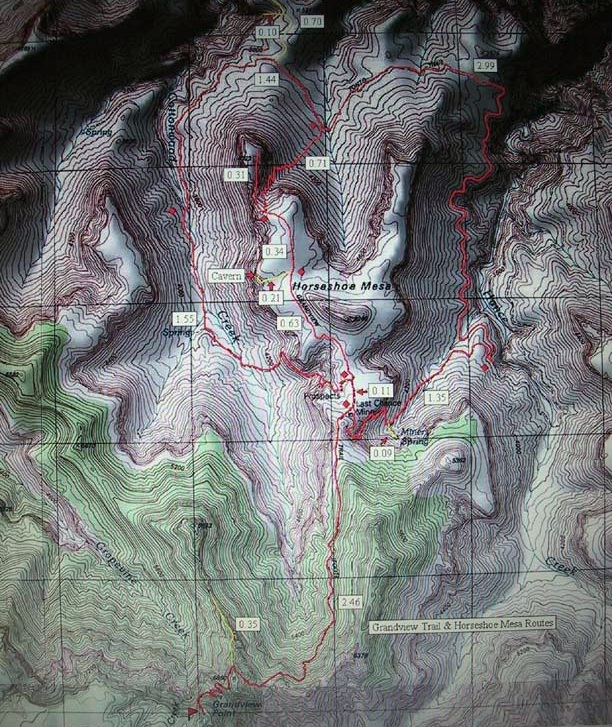 The coordinates of this trail intersection are N36 01.204', W111 58.544', elev. 4899. More info on the Grandview Trail is listed below under NPS. Explore to your heart's content. Disturb nothing. We spend an hour and a half or so exploring the cavern. After entering, to the best of my recollection, we walked left down a corridor, ascended a ramp, climbed down another ramp, crawled through a passage, wound our way through a room or two bearing inscriptions of other visitors on the walls, and arrived at a large transept corridor. The floor was maybe 10 to 15 feet wide. The walls arched over us joining one another 25 feet or so above us. The corridor was nearly straight, appearing to follow a fault line, and maybe 200 feet or more in length. We walked to the end and then explored a little grotto off to the left. A few of the tiny stalactites glistened with water droplets at their tips. On the way back we explored a little more along other routes branching from the end of the corridor at which we entered. Grand Canyon NPS Reports THE GRANDVIEW TRAIL IS DANGEROUS IN WINTER. HARD ICE OFTEN SHEATHES POTENTIALLY HAZARDOUS PASSAGES MAKING SOME SORT OF TRACTION DEVICE (I.E. INSTEP CRAMPONS) MANDATORY. Use extra caution around mines. The rim of the open pits is often unstable. Rotting support timbers in the tunnels pose an obvious hazard. The many artifacts scattered about are protected by federal law. Enjoy what you find but leave it as found. With the exception of "Cave of the Domes", permits are required to enter caves in Grand Canyon National Park due to the extremely sensitive nature of cultural and natural resources inside. Contact the Backcountry Information Center for further information.